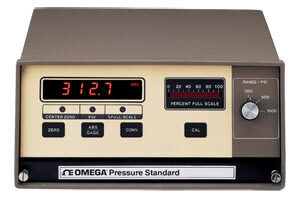 PCL-3000 Series digital pressure standards are specifically designed for use in the manufacture, testing, or calibration of pressure-sensitive devices. Using a patented, bonded foil strain-gage sensor and advanced microcircuitry, these rugged, compact instruments provide simultaneous digital and analog readouts of the pressures applied. Standard front panel switches permit desired pressure range selection, automatic zeroing of the display and actuation of a unique internal self-calibration feature. Each instrument has two displays, digital and analog. The digital display provides precise pressure information and the analog display gives a quick reference to direction and level of pressure. 注: All models come with an NIST traceable calibration certificate.